On a cold Fall day, Caroline walked into the local office of a well-known charity in New York City in desperate need of one item: diapers. Although careful with her spending, Caroline was stretched thin financially supporting three young children on her own and simply could not afford another package of diapers and wipes. She hoped that, this one time, the charity could help her out for the next few weeks. A few minutes later, Caroline left the office empty-handed and in tears. Unable to provide the requisite paperwork, the charity turned her away. Desperate and without any other options, Caroline emailed Bundles of Joy. Caroline, who is in her mid-20s, grew up in the Dominican Republic in a stable, loving family. However, two years ago she found herself fleeing her home country to escape an abusive boyfriend. With two young children, a son and a daughter, she left for the United States, knowing no one. Hoping to start a new life, she entered into a new relationship a few months later. Unfortunately, her new boyfriend was abusive as well and, a few months later, she found herself escaping another domestic situation. A local shelter arranged for her to be transferred to a shelter in New York along with her two kids. Alone and even farther away from her home country, Caroline was terrified. Shortly thereafter, Caroline’s life would change dramatically once again: she was pregnant with her third child. “I was in shock knowing I was pregnant from the abuser,” Caroline says. Caroline credits the shelter, which provided her with counseling and therapy as she dealt with her pregnancy and post-traumatic stress. But shelter life was still incredibly difficult. Caroline and her kids moved from one shelter to the next. Although grateful for a roof over her head and how the shelter provided blankets, utensils and basic food for her family, tenants like Caroline were expected to apply for public assistance and navigate the myriad appointments, meetings and paperwork on her own. With food stamps, Caroline was able to provide food for her children, although every month she cut it close. With clothes and cleaning supplies however, she often ran out of money, as the shelter did not provide these items. Even after carefully budgeting and not spending outside what she was allotted, Caroline often had to make sacrifices. “I only buy the stuff I need last when I know my children have what they need,” she says. Caroline gave birth to a baby girl in September. Although a happy and healthy baby, Caroline found herself in even more of a financial bind. She looked forward to the day where she could work to provide for her family and move out of the shelter, but during this transition time, the constant stress of her family’s situation led to anxiety and depression. She was also faced with another harsh reality: diapers are expensive. When Caroline got home she emailed Bundles of Joy, who reached out to a network of Joymakers in the City. A very special mom gave Caroline boxes of diapers that her son outgrew. She left them with her doorman so that Caroline could pick them up later that night. The help came at a perfect time. Today Caroline is prepared for another move, this time to the Midwest. However, the occasion is a happier one this time – she has housing lined up and a job opportunity. An opportunity to start fresh and raise her three children in a happier environment. Her youngest, now seven months old, is growing fast and cared for with the products provided by Bundles of Joy. Although still stressful, these essentials are one less thing Caroline has to worry about. Caroline’s experience in New York left such an impression on her that someday she hopes to one day pay it forward and start a similar organization wherever she ends up. Many people don’t know that shelters don’t provide essentials such as diapers and wipes, and that charities oftentimes turn down requests for these items. Many times, parents like Caroline are often left choosing between rationing diapers and using less suitable alternatives. Unfortunately, Caroline’s story is not unique. There are countless other stories like hers in the New York area and around the country. This is why we started Bundles of Joy: to provide the essentials needed to help mothers and babies thrive, no questions asked, in their hour of need. To help more moms like Caroline, please consider donating here. Giving Season was successful, beyond our wildest dreams, thanks to you. We served more children than we imagined we could, engaged with more volunteers than we knew we had, gained the support of more local businesses, and lightened the burden that so many families feel in our community. To say we are lucky to have such amazing supporters is a gross understatement. It’s our privilege to pass on the JOY you bring to others, thank you. It is perhaps the best “middle person” position, ever to connect those who have with those who need. Thank you to each and every one of you, whether you donated your time, funds, or purchased items directly for our babies. You’re Joymakers through and through. So many of you rallied for Giving Tuesday and beyond and it means the world that you chose support our mission, our babies, our families, our people. With so many worthy causes out there, it is an honor to be your charity of choice. Boxes upon boxes were piled at our door for weeks because of those of you who shopped our amazon wishlist. The majority of those items are already in the hands of those who need them. Those who purchased Bundles or donated money allowed us to pack Bundles with all the essentials like, diapers, bath wash, diaper cream, and socks. You enabled us to fill the holes and meet all the needs when physical donations came up short. For those of you who sorted donations, arguably the worst job we have, THANK YOU. Can we do that again, please? You made it possible for us to bring our inventory to a Mount Vernon shelter and deliver warm weather clothing. Not to mention our amazing gift wrappers. What would we have done without you? We never would have been able to wrap all those gifts. Thank you, thank you, thank you all. Thank you to all those who hosted collections for us, Sammy + Nat, Keller Williams, Bronxville Wellness Sanctuary! We received INCREDIBLE and mind-blowing stuff. Finally, a special thank you to those who “adopted” specific families to make their holiday wishes come true. We delivered to shelters and foster homes - arguably the most vulnerable families we know. Your gifts gave them joy and hope - two things they desperately needed. For families who have to choose between diapers and food, having gifts to open on Christmas morning was a dream come true. Thank you. We are proud to boast that every single order we got was filled before Christmas. We never had to say NO, thanks to you. Our Joymakers inspire us to do this work. It is YOUR kindness and generosity that give us our positive outlook. No matter what is going on in the world, we see the very best in humanity. We see people who give to strangers because maybe they remember what it was like having a newborn and changing them 13 times a day, or perhaps they also have a fast-growing 3 year old and know what it’s like when they wake up and suddenly their clothes don’t fit. We have moms who take time away from their own families to deliver to babies in need. They know that an hour of their day can change someone’s life forever. We have Joymakers who think of us every time there’s a clothing sale and they stock up on essentials for us. We are beyond lucky because so many of you want to bring joy to those who need it most. Giving Season is finally upon us and Bundles of Joy is busier than ever trying to meet the demand of our neighbors in need. I joke that Giving Season for charitable organizations is the equivalent of Tax Season for an accountant. Needless to say, we are very excited about the many great events and opportunities we have for those interested in giving back and getting involved with Bundles of Joy. Right now, we can use ALL the help we can get. If you’re able to attend an event - Email Adrienne@BundlesOfJoyNY.org to save your spot! Join us at Westy’s in Tuckahoe - we’ll collect winter donations and sort in preparation for our POP Up Event. We’re looking for warm clothing, outerwear, and you can always drop off new hygiene and toiletries as well! We need many hands to help us sort so this is a great opportunity to give an hour of your time that will make a huge impact. Got gift wrapping skills? Help us wrap holiday gifts for children living in homeless shelters. We’ve got the toys - we just need YOU! This will be a fun event and we encourage any and all young wrappers accompanied by a grownup. A personal favorite - this is what it’s ALL about. We’re brining our inventory to families living in a local shelter and giving them a shopping experience! We’ll bring loads of gifts for all the kids to enjoy while their parents “shop.” We’re looking for volunteers to help parents find sizes, search through items and hold adorable babies. You’ll leave feeling like you’re on top of the world. We’ll be delivering lots of JOY to babies and toddlers we’ve been working with throughout the year. There is no greater feeling than Holiday Cheer and seeing these kids smile. We need a couple volunteers to help us deliver and pass out toys. Shop Sammy + Nat pajamas - For every pair sold, they’re giving a onesie to a baby in need! Giving never looked (and felt) so good! You can get yours online at www.sammyandnat.com or visit them at The Westchester (across from Santa) or their Rye location 88 Purchase Street. Purchase directly from our Amazon Wishlist - You’ll find the in-demand items our families are requesting this season! We aren’t just giving away toys, we’re giving loads of Bundles filled with essentials (like soap, socks, mittens, hats and more) so that families have the tools they need to thrive. Donate - Drop off your items anytime at the Bronxville Public Library - Second Floor or if you don’t have items to donate, Buy A Bundle and we’ll fill it for you! It will have everything that child needs to get them through the season as temps drop. Spread the Word - this is the easiest way to help us! Let people know what we’re up to so that we can reach even more kids in need. BoJ is all about connecting those who have with those who need so please pass on the good word. We recently packed up over 60 bins filled with clothing, gear, feeding supplies, baby carriers, bedding, accessories, even halloween costumes, and brought them to a local homeless shelter. The Coachman Center in White Plains is one of many residences that Westhab operates. It has 100 units, all filled with families, many of whom with small kids and babies. It took me and Viviana a solid week to organize everything and prep for the big day. I always get really anxious and I put tons of pressure on myself to make everything “perfect” (I hate that word) for the moms and kids. I’m a total wreck before, ask anyone. I put myself in the shoes of someone who has kids, is homeless and has school approaching. I try to imagine what I’d want. How I would want someone to treat me. The purpose of the pop-up “shop” model is to bring our inventory to our clients and give them a free shopping experience. Something they wouldn’t otherwise get. So it was game day - I put on my new shirt, custom stitched and hand-delivered by Brooke of Monogram Mary, and I headed out the door to pick up my bestie, Julia. We drove from Bronxville to White Plains chatting about whatever silliness popped into our heads. Laughing about our kid’s recent escapades and discussing comedian Ali Wong. She took my mind off of what we were about to see and do in the way that only a best friend can do. I was calm and ready. We met so many moms and their sweet kids and babies. I absolutely LOVE pop up shops for this reason. I get to connect with the moms and share our time, as mothers. I always say that motherhood is the universal equalizer and it’s true. My amazing volunteers from Bronxville lead very different lives on a day-to-day basis than the moms we were serving that day but our children brought us together. They’re our common denominator. No mater who you are or where you’re from, you love your kids and you want the very best for them. That is at the core of what we do. That is at the heart of every Bundle. It brought me a lot of joy to meet our moms and to make them happy that morning. One mom cried on my shoulder because she was so grateful for the experience. Another mom, whom I won’t ever forget wrote me the most beautiful email after the event thanking me for what we do. I spent a lot of time with her, getting to know her story and meet her kids. She spent hours picking out clothes and her daughters had a blast! She told me they went back to their room and played “Bundles of Joy” setting up their own donations. I just burst into tears. I recognize how lucky I am to be allowed into the lives of the people we serve. I am so grateful that people are willing to share their stories with me, let me hold their adorable babies, and tell me about their struggles, because we all have them. I always leave these events feeling humbled by their gratitude, grateful for my own circumstances, appreciative of all the opportunities I’ve been given and for all the help and support I’ve received along the way. So that is a long way of saying THIS is what fills me the most and I want to do more pop-up events. I love being with the moms and babies - that’s where my heart is right now. We will definitely continue to fill orders the way we typically do but you’ll see more of these events and more opportunities to spend your time with us. I owe you another update because a lot has happened since our initial drop off a few weeks back. So many of you have blown us away with your donations, volunteering, going above and beyond and we wouldn't be here without you. I feel like I can't say 'thank you' enough. I mean it. After we dropped off several car loads of items from all of you, Abbott House expressed that the biggest way we could help was not through any more material donations but through our expertise in managing a warehouse. So, of course, we rounded up our best volunteers from Bronxville and Scarsdale and sorted through mountains of items. They had everything! Clothes, shoes, food, hygiene items, toiletries, toys - they wanted for nothing. (I was actually jealous because I wanted Bundles of Joy to have a warehouse like that!) The only problem was, nobody could get to anything because it was pure chaos. So, enter Bundles of Joy - we quickly fixed up the warehouse in just a couple of days but the biggest issue was clothing. If anyone watches my stories, you know I spend a significant amount of time sorting through clothes. It's a very unglamorous job. I'm usually in a full sweat, hair a mess, clothes a wreck, no makeup, sorting is not my finest hour. There isn't any way around it or shortcuts. It's tedious but necessary. We sort for quality and then we organize by a system we've created so items can be found easily. Anyway, let's just say Bundles of Joy knows a thing or two about sorting. I was lucky enough to have volunteers who offered to help sort their many many rooms full of clothes. Jen, remember her from Scarsdale? She and her amazing posse of moms spent hours and hours carefully sorting through all the clothing donations. They still aren't even finished yet! This is a huge opportunity for anyone who is detail-oriented and interested in helping Bundles of Joy/ Abbott House. If clothing isn't sorted, it's useless. Nobody can find it, nobody knows it's there, kids won't get it. We'd love to have you if you're willing and you can email me adrienne@bundlesofjoyny.org to get involved. We love our partnership with Abbott House and hope to continue our relationship with them. We happily lend our expertise and services because this is what brings US joy. Our mission is to reach the most vulnerable, those who need joy the most and we've definitely done that through them. Failing Our Own - Foster Children in the U.S.
Two weeks ago, while delivering a giant shipment of essentials to Abbott House in New York City for the migrant children sent there after being separated from their parents at the border, I was approached by one of the employees at the home. After thanking us for the supplies, she broke down into tears, overcome by the emotion of the preceding few days. On one hand, she was tremendously grateful for our help, but on the other hand, her heart broke for all the other children that the organization serves – primarily foster kids – who simply never receive this type of support from the public. That moment has stuck with me ever since. Quite frankly, that whole week has stuck with me. How could it not? From the time the public first learned about the family separations taking place at the border, to learning that many of those children would be sent thousands of miles to the New York area, it was a heart-wrenching few days. Here were children, already afraid and traumatized, now separated from their only source of stability and comfort – their parents. After the initial shock and sadness wore off, I knew I had to spring into action and help out those kids coming to the New York area. With the unbelievable support from so many of you, Bundles of Joy was able to provide needed essentials to the migrant children as they arrived at Abbott House. But rather than feel a sense of accomplishment, that afternoon only further confirmed just how staggering the need is, not just for migrant children, but for millions of kids born in this country as well. A recent New York Times article sheds light on the plight of foster children in our country, who are often forgotten by America at large. When children are not provided with the adequate love and support that they deserve, the consequences can be devastating both short and long-term. To think that one in five children live in poverty and represent one in five homeless people throughout the country is terrible. It is tragic. It is horrifying. It makes me mad. No child should ever feel unloved or forgotten. Foster families and nonprofit agencies do their best to provide for these children, but the need is so extensive, so great, that they are often overwhelmed. Inevitably, this is where politics usually enters the conversation. We could talk all day about the need for more funding, cultural and societal changes, and the politicians who may or may not seem to care. Rather than point fingers and argue, I want this to be instead a call to action. My hope is to shed light on this issue so that each and every one of us, if we can’t help these children immediately in some way, are at least thinking about these kids. They deserve support. They deserve love, even if comes from complete strangers. The mission of Bundles of Joy is to help these vulnerable children, who are living in the foster care system or in poverty, receive the vital care they need early in life. With the right support, we can give these kids a better start, and hopefully, a better future. The need is year-round. Although we are a small operation, we do what we can to make sure that no family or agency that reaches out to us for essentials is turned away. But we need your help. We may not be able to help every child in the country, but every bundle, every donation, can be a ray of light for a family or child. If we can lighten the burden of a mother struggling to care for her newborn, or help out a wonderful organization like Abbott House care for the many deserving kids in their system, we can positively affect the futures of countless children. I always say, you don't have to look far to see a need. For those moved to do so, please consider Buying a Bundle or contributing funds that go towards purchasing new items like toiletries and hygiene products. We also recently started a "Birthday Joy" program where we purchase new toys for children celebrating milestones in shelters. Thank you to the many who've supported our efforts - you've truly made a difference. Since the news hit on June 21st that migrant children, separated from their families at the US border, were sent to East Harlem, Bundles of Joy has been working tirelessly. With the help of our generous donors and volunteers, we've delivered over $4,500 in goods, and raised a total of $7,000 thus far. That's pretty incredible!! We still have funds slated for this cause, but are waiting to see where it's most needed. Right now, I can assure you -- the children we are working with have what they need. I'll back up just a bit and tell you how we jumped into action and give you a bit of an update on our current work. Back to June 21, when the kids arrived in New York. I had a feeling that Mark Levine's office wasn't prepared to accept physical donations for long and before morning, he had to put a hold on all physical donations, asking people to donate funds instead. Bundles of Joy continued to accept physical items because we were lucky enough to work directly with the Abbott House, a foster care agency serving Westchester and NYC. Over 50 kids were placed with them in their TRC program. This program welcomes children entering the United States without a legal guardian. They provide short and long-term care, including room and board, case management, counseling, medical and educational services. I happened to call at the right time to catch the Chief Development Officer and she was thrilled to hear from us because of our deep understanding of what kids really need. And just like that, we became partners in caring for over 50 children. We started off emailing and then that turned into texting ideas and brainstorming how we can best serve these kids. I spent all weekend opening boxes and sorting items. If you watched IG stories you would have seen USPS back up into our driveway because he had over 40 heavy packages! One supermom who follows me on Instagram wanted to help so I asked her to find inexpensive flip flops. BOY, did she deliver! She learned that Old Navy was having a $1 flip flop sale that next morning (Saturday) so she rounded up 7 of her friends to shop them in various sizes. This lady went above and beyond and I will never forget her. Melanie, thank you. My mom heard how tired and overwhelmed I was and decided to make an emergency trip to Bronxville with my dad to help me. I don't think I would have survived without her. Thank you, mom and dad. Also, thank you Steve and Levin ...my two delivery men (who I am sure don't follow me on IG or my attempt at blogging) who broke their backs carrying very heavy bath wash, wipes, and diapers. We were the VERY first organization to deliver items on that Monday morning. We reached them even before Levine's office, who, let's face it, has WAY more resources at his fingertips than little old me. I recruited mom friends of mine who were INSANELY kind to give up their time and deliver car loads of items. These moms have kids of their own at home to take care of and I am eternally grateful that people want to help. These particular moms are true supermoms. Thank you. Then, we made another delivery on Wednesday thanks to a group of supermoms in Scarsdale. An old camp friend of mine saw what we were doing on Facebook and asked to help -- be careful of what you ask for, because I will put you to work. She rounded up a group of awesome moms who collected items, bought items and then delivered them to the kids. They ordered Spanish books, games, activities, stuffed animals and fun things to make them feel JOY during this separation. So, all this is to say THANK YOU to the MANY MANY MANY of you who have donated items, contributed funds, asked to help, offered time, drove miles to deliver goods, hired babysitters so you could spend time with us, etc. I wish I could call out each and every single one of you, but I can't. I saved all of your notes from the Amazon registry and many of you wrote such nice and encouraging things to me. Thank you. The very first question out of everyone's mouth is, "what do you accept?!" I encounter generous people every single day who are excited to donate items to Bundles of Joy - we are so lucky. Thank you! I always say that it is our donors who make this model possible and I am merely the middle person connecting those who have with those who need. It's true. What sets us apart from other organizations that repurpose clothing is our (high) standards. We say, if it's good enough for your kids, it's probably good enough for the children we serve. That being said, we only repurpose new and "like-new" items free of stains, wear and tear, religious or familial insignia ("Best Big Sister" or "Daddy's Girl" isn't family-sensitive). We recycle all other clothing that does not make the grade because we only include the very best in our Bundles. That's because the people we serve deserve wear fresh clothes. Imagine excitedly opening a Bundle, only to find leggings with holes worn in the knees, sweaters with pills on them, onesies with formula stains, or worse? What kind of message is that? It doesn't feel good as a parent to dress your babies in tattered clothing. We all believe our kids deserve the best. They do! Our purpose is to help parents feel confident, to help them feel proud, all while maintaining their dignity. If these Bundles don't bring JOY, then I want no part of it. I've been to several organizations that have the gaul to pack clothing in TRASH bags to give to kids. Imagine getting a trash bag of toys and clothes? Is that really supposed to make you feel valued? Trash bags are for TRASH. This is all to say, don't be afraid to send us your items even if they don't look brand new. We promise to never shame you or judge you. We discretely recycle items we cannot use and those that pass bring LOTS of joy to our families. I don't typically write about myself because who cares, right? Well, I agree! I don't aspire to be a lifestyle blogger, I don't show my kid's faces on this instagram account and if you know me in real life you know I'm somewhat of a private person. Anyway, there are some new faces around here and the question I get asked most often is "how did you decide to do this?" Here's a little of "my story." I'm Adrienne, the Founder of Bundles of Joy. I am in my early thirties, I'm married to my wonderfully supportive husband, Patrick, and we're proud parents of two little ones, Sloane (3.5) and Wesley (1). My own kids are inspiration for Bundles of Joy, actually. If it hadn't been for them, I don't know if I would have realized my passion for helping others in this very specific way. I remember the moment very clearly when I decided I wanted to start my own not-for-profit. Patrick, Sloane and I were in a long car trip coming back from Thanksgiving when Sloane was only a few months old. I announced to him that I wanted to start my own version of this organization in Boston. When I was pregnant with Sloane I volunteered for an organization with a very mission of providing essentials. For some reason I just couldn't shake that experience. I kept obsessing over the basics that parents were asking for. At the time, we were living in Boston and Patrick was in business school at MIT Sloan. I was working for an ad tech start-up -- a very big departure from my previous experience in NYC government. Anyway, it was fun. I can't say I loved the work because I didn't. I wasn't passionate about it but I DID love the people I worked with. The analysts I managed will always hold a place in my heart. I also really loved my boss. Anyway, I digress. I worked there while I was pregnant with Sloane and went on maternity leave when I had her. While I was out there were huge layoffs and I was cut. Just. like. that. I've never been laid off in my life and I had a 3 week old baby looking to me to provide EVERYTHING. I know that this happens to people a lot, actually. It's sadly "easy" to lay people off on maternity leave, even though there are some protective laws. The truth is, I wasn't planning on returning to that position but it got me thinking how awful it is for the many many many women who are killing themselves to take care of their families and just can't. They are trying to work but get laid off. No explanation, no sorry, nothing. Also, how do you expect a new mother of a 3 week old to find a new job? There are so many things that make me angry about this situation, and not for me, because I was fine but for the others who aren't as lucky as I was. I also couldn't help but feel like a failure. I didn't even want to go back to that job and yet I felt like a loser. That is no way to start motherhood, right? Listen, I know this happens a lot. I know I am really lucky and I am not seeking anyone's pity in this situation ESPECIALLY since I was planning on being home with Sloane anyway. The point is, this situation really affected me and changed the way I thought about those in need. I could be helping someone just like me. It's very personal to me and every bundle I pack, I put myself in that person's shoes. I imagine what I'd want most. So, that is my story of how I got to here. I hate hate hate when people say "thing's happen for a reason," because I think thats such a retrospective, passive, annoying thing to declare...but in this case, all these things happened and got me overcome the fear of starting my own organization to do what I feel most passionate about. I feel really lucky to have found my purpose and I'm grateful to be able to pursue it with the support of my family and community. This post is LOOOONG overdue. Celeste from The Cozy Cup approached me after finding me on Instagram and wanted to get involved with Bundles of Joy. Celeste is the mastermind behind The Cozy Cup -- a full service afternoon tea party. She had this idea of hosting a tea in honor of Bundles of Joy, where her guests would bring items to bundle for newborns. I, of course, jumped at the opportunity to work with Celeste and the rest was history. She and her family and friends made 19 gorgeous bundles with clothing, toiletries, toys, and gear for our littlest customers. They were sent to Lincoln Hospital in the Bronx, where the need is so great. Celeste, you are a rockstar, hero. Here are a few photos of the event and the bundles she made. Make sure to check out her site www.thecozycupnyc.com and book her for your next event. I'm definitely going to have her come over and host afternoon tea for Sloane and a few of her friends. What I love so much about Celeste is that she was able to give back in such a unique and personal way to her. She took what she had to offer and put a Bundles of Joy spin on it. This just shows that you don't have to be conventional to give back or make a meaningful impact. I would encourage anyone who wants to get involved to think outside the box. Since we are such an early stage start-up, we don't have to stick to any sort of convention. I dare you. Lastly, I want to formally thank Celeste and her wonderful guests for their incredible donations. Their bundles were AMAZING -- they even wrote personalized notes to the mom/ baby. We are so honored and humbled by your generosity. Thank you a million. At the beginning of every school year, my son gets a calendar of school events, holidays and breaks. I quickly glance at it, and then it lands on the refrigerator, only for me to find in a panic a few days before whatever school break is upon us. Winter break, which happens this year from February 19-23, is no different (although I did happen to burn these dates in my mind since the Christmas/New Year break seems like yesterday). As a working mom of a 3.5 year old and small business owner, I’m constantly on the look-out for creative and affordable ways to entertain and engage. 1) Build a fort. It’s true--you don’t need to spend a fortune to have a blast. Pull your couch apart, get out some sheets and blankets, grab a few chairs and build a fort. You’re only limited by your imagination so let go for a bit. It’s quite refreshing to be 5 again. 2) Play tic-tac-toe. It’s a simple idea that seems almost too simple. But break out a blank piece of paper and a pen, draw the 9 section grid, go over the X and O rules with your kids and bring on the competition. Best 3 out of 5 games wins the choice of what you’re eating for dinner! 3) Have a picnic (on the floor). My family loves picnics so when it’s cold, we bring them indoors. Throw a table cloth or sheet on the floor, break out a few crackers, slice some cheese, cut up some fruit, and lay out other quick snack food. Grab the milk or juice boxes and you’re instantly transported to warmer weather and the sweet smell of grass. And meanwhile, you’ve turned snack time into fun time. 5) Make popcorn with surprise seasonings. Popcorn. It’s popping power is so underrated. Whatever your popping method, the fun doesn’t need to stop there. Why not create a few popcorn seasonings to add some flavor to your healthy and delicious snack? Let the kids “get in the mix” so they can melt in a bit of butter, add spices, or sprinkle in cinnamon and sugar to create flavors all their own. Have blind taste tests and see if anyone can guess the various seasonings. I got this awesome idea from Lil Chameleon’s cooking coach, Chef Jen, who runs our popular cooking classes for lil chefs. It’s a hit in my house so I know it’s tried and true. You can’t take another minute in the house? Why not visit Lil Chameleon? But what is Lil Chameleon? I thought you’d never ask! Lil Chameleon is a premiere resale boutique where you can buy, sell and trade some of your kids nearly-new clothes, toys, books and gear, and earn 30% in cash or 50% in store credit. With fun and unique items in nearly every price point, it’s a fun store to explore. There’s a self-serve café with snacks to savor while your lil ones play. And there are even free or low cost events to enjoy. For more info about everything Lil Chameleon offers, check out www.Lil Chameleon.com and take a peak at the classes and events. There are always a variety of activities, all while helping families with life’s lil things in mind. Dancing on the ceiling at Studio Anya in NYC! We've all been to *those* fundraisers--the overpriced country club dinners, the overcrowded cocktail parties, and the over-the-top corporate galas. And frankly, we're kind of over them. What we do at Bundles of Joy is all about bringing women together to lift each other up, and we want that to be at the heart of everything we do. And that's how we found The Good Karma Project. The founder of Studio Anya, Courtney Bauer, created the Good Karma Project as the charitable dimension of her incredible multifaceted fitness studio and spiritual center in the heart of NYC's Chelsea neighborhood. They offer yoga, Pilates, aerial yoga, and meditation, but most of all, they offer community to hundreds of people each week. We were honored to be selected as the recipient of this month's Good Karma Project donation-based class, and of course, we had to come show our support in person! There's a lot about fundraising that requires you to get out of your comfort zone. It can be challenging to ask for money and goods from strangers; to stand up and talk about yourself and what you're doing and assert that it deserves the time and attention of other people. Luckily, it turns out an aerial yoga class is the perfect place to do this, because everyone's out of their comfort zone! It's hard not to giggle and feel joy when you're hanging from the ceiling by only a piece of silk wrapped around your hips, or to feel warmth and connection when you accidentally high-five the girl in the hammock next to you. From the moment we walked into the studio on a rainy Superbowl Sunday, you could feel the warmth and joy that fills the space, and we so appreciated the opportunity to connect directly with our incredible teacher, Jana Hicks, and her students both old and new who came out to support Bundles of Joy. That's what we love, and that's how we'll continue to get the word out about BoJ, so if you're part of a community that you think would love a reason to get together and improve your karma, contact us and let us know! And if you're ready for a different kind of hanging out, try a class at Studio Anya! Thank you Jana and the amazing team at Studio Anya! The very nature of what I do is about extremes. The haves and have-nots, the joy and sadness, the lucky and very unlucky are intentionally linked by our organization, and sometimes it's hard to sort through those emotions. This past weekend was a perfect example of how that complexity is echoed in the lives of every mom. We visited a residence for young mothers and their babies. The 26 moms living there each had their own struggles, and many were hardened by "the system," and saw us as "just another charity." Not everyone was happy to see us at first, and I understand that. It took some time to get them to trust me and see me as more than someone who takes a ceremonial photo and drops off clothes that nobody else wants. I wasn't going to let that be our reputation! I decided to turn our 17 bins of clothing into our first ever pop-up shop, so moms who'd never gotten the opportunity to go on a shopping spree for their babies could have that experience. They had free rein to pick whatever they wanted, free of charge, of course. After helping a few moms pick out clothing and baby carriers, the room loosened up--you could actually feel it in the air. We talked babies and motherhood, and at times I felt like I was just talking to my mom friends. Before I knew it, moms were passing me their babies to hold while they shopped the inventory. I was really genuinely happy that they were happy. There are some moms I just won't forget meeting. I think they touched my life more than I did theirs. One mom, who brought her 5 day old baby, was really special. She was so happy and positive and bright. I personally can't imagine being in that situation and having such a positive outlook. I looked at her and thought "how does she do it?" "would I have been like this?" I met another mom who was expecting, and had a toddler plus an older child from whom she was separated. I knew she was sad and her eyes filled up with tears when I told her that she's strong. There's nobody stronger than a mama bear. I felt her pain and wanted nothing more than to reunite her with her family. I truly hope she gets well. Did I leave feeling like I solved all their problems? Of course not! I didn't. I felt good that I was able to give them an experience that they don't often get. I was happy to know that I was able to give them the material things that they and their babies need, and I was especially glad that to feel like I connected with some of the moms and give them encouragement because what they're doing is hard! It's hard to walk away knowing that I can't fix all their troubles. I know that statistically many of these moms and babies will continue to suffer. But, for that one morning, there was joy. I love pulled pork but what I love even more are dinners where I only have to prep for 5 min. This is the easiest thing I've ever made and it doesn't taste "easy" if you know what I mean. I would feel proud to serve this to guests who were over watching the football game. Also, I HATE fatty pulled pork, it makes me gag just thinking about it. The best part of using tenderloin is you won't have to deal with that fat. Combine all ingredients until you have a "sauce" to cover the tenderloins. 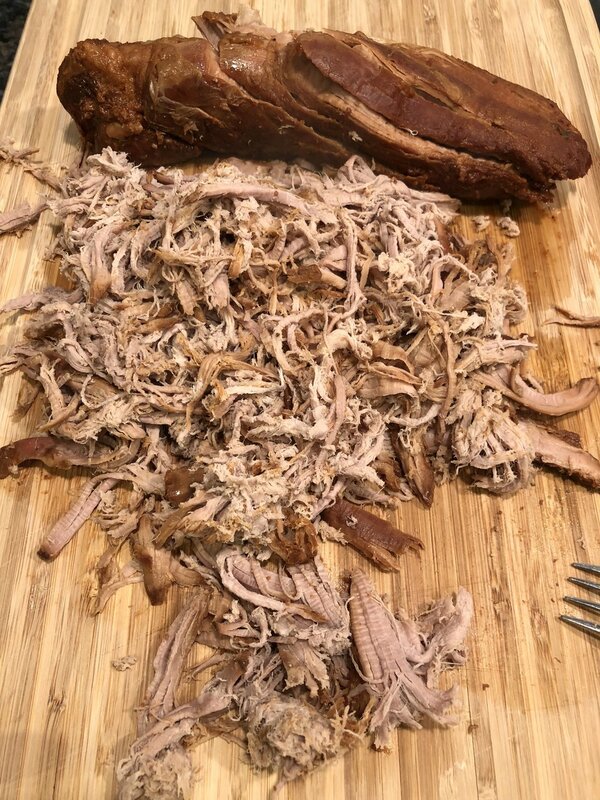 Set your crock pot on low for 8 hours or high for 6 and you have the most delicious puled pork. Shred apart with fa fork and serve with BBQ sauce. Last night I made this meal with roasted broccoli (my kid's favorite) and fries. We also had really yummy pickles because you can't have pulled pork sandwiches without pickles. Try it and let me know you love it. What products do I really need for my baby? It's a question every new mom has asked herself, whether she has too much to choose from or not nearly enough. The essential baby products for your little one depend on your child, of course, but between being a mom of 2 and stocking dozens of bundles every year for other moms and their babies, I definitely favor certain brands and products over others. Here's what I gravitate towards and why. California Baby - They smell amazing, they're safe, and gentle. Need I say more? It's the trifecta of baby product. I personally use these on Sloane. The shampoo, conditioner and bubble bath are primo. Also, the bubble bath comes with a wand for blowing bubbles. It won't disappoint. Mustela - I love how gentle Mustela is on skin. Wesley (10 months) is BEYOND sensitive. He thinks about fragrance and breaks out in a rash, I swear. I highly recommend this entire line. It's also safe and free of chemicals. I especially like packing newborns and babies with fragrance free items, so this is a great option. Cetaphil Restoraderm Eczema Calming Lotion - Wesley has had luck with this lotion. We put it on right after his bath to lock in moisture. It's really light and not at all sticky but does the job. I always trust Cetaphil, I even use it on my own skin. Love it. Aquaphor Baby - I have yet to find a problem that Aquaphor can't solve. Chapped lips? Diaper rash? Dry patches? Rough feet? Get Aquaphor. I even dab some on Wesley's cheeks before we go outside for a walk. This stuff does it all. Desitin Extra Strength - This is by far my favorite diaper rash cream and I prefer to use this in all our bundles. For us, it just works. I've tried the competition and it's the best. Oral-B - I love the super soft Oral-B toothbrushes. Sloane goes nuts over brushing her teeth (see below). Today at school she told her teacher she is going to be a dentist AND a horseback rider. This 3 year old has serious career goals, right? I linked a toothbrush that is good for babies from 4-24 months. It's really important to always check the ages because their gums are so sensitive. Tom's of Maine Training Toothpaste - We use this because Sloane hasn't mastered the art of spitting (toothpaste). She's really good at spitting at you, though. I get nervous with fluoride toothpaste because it shouldn't be ingested. I've caught Sloane on several occasions eating the toothpaste so thank goodness it was non-fluoride or we'd be in the ER getting her stomach pumped. I haven't tried it myself, but I guess I can safely say this stuff also tastes good. Water wipes - Wesley had bad diaper rash as an infant because of his wipes I used prior to switching (FOR LIFE) to water wipes. I even used the "sensitive" kind of a very popular brand but they were still too harsh for him. These are incredible and life-changing and probably my favorite product of all time. Since they're mostly water I always have them on me to clean faces and hands. Boogie Wipes - They're a little pricy for something you wipe your nose on BUT they work well and have saline in them. They clear out the nose much better than a regular tissue and relieve their sensitive skin. Try these on your own babies and while you're at it, send us one to bundle up for a baby in need. What are your family's favorites? We are always on the hunt. I've thought a lot about what I want for myself this year. I actually treat my birthday as my very own "New Year" but this seems like as good as time as any to share what I am working on. As a mom of 2 and founder of a start-up, I rarely have time for myself. When my husband Patrick comes home from work at the end of the day, I tell him "I have literally not sat down ALL day, and I do mean literally." I do squeeze in a workout during their nap (thank you Tanya Becker and Physique 57), but aside from that, "me" time is scarce. It's not because I don't prioritize myself or I have a bad husband or kids etc. it's because that's the stage of life I'm in right now (by choice!) and it's very time consuming to run a startup and have a family and be successful at both. I am certainly not complaining because I love nothing more than being home with my babies and it gives me so much personal satisfaction to do the work I get to do for Bundles of Joy. That being said, this year I NEED to work on my patience. For my sake and my family's. I don't know if it's the 3 year old stage of life that is soooooo trying or what, but I have been feeling myself getting agitated more easily and I hate that feeling. So, I am going to attempt meditation and I'd love any advice or recommendations. In fact, one of the things that I am MOST excited about right now is our upcoming event with Studio Anya in NYC. The Founder, Courtney Bauer, asked me if we'd like to be part of their Good Karma Project, where they donate classes to benefit a local charity. I obviously JUMPED for JOY and happily agreed. They've generously donated 2 classes, aerial yoga and meditation on February 4. 2018. I honestly could not be more excited and also honored and humbled by this incredible gesture. That's where I am right now so I will definitely update you on my meditation journey. Hopefully it will give me strength...because anyone going up against a 3 year old needs it #amiright?! If you'e in NYC please come out an join me on this adventure!!! #RealTalk with #RealMoms What were you least prepared for after giving birth? We asked and you answered! Thanks to those of you who responded on Instagram. It's so nice to have an online community of moms to learn from and I love engaging with each of you. Here are the top 10 things you said you were least prepared for after giving birth. It's so nice to know you're not alone, isn't it? It's hard work bringing these little people into the world, even in the BEST circumstances. * If you or someone you know is experiencing postpartum depression or anxiety please visit http://www.postpartum.net/ to see how you can help. "Toddler Approved Chicken Noodle Soup"
A very good mom friend of mine recently mentioned that her daughter (also 2 1/2 like my little girl) is going through a stage where she only wants to eat macaroni and cheese and yogurt. Meal time can be really frustrating when your kids refuse to eat. However, just like sleeping, I'm of the philosophy that you have to "teach" your kids to be good eaters. Yeah, it takes more effort and sometimes they'll leave the table after four bites of food, or even better, my daughter told me that my cooking tasted like "dog poo poo" the other night (direct quote). So I started to think of easy and nutritious toddler approved food for my friend to make for her daughter. My first suggestion was Chicken Noodle Soup. I mean, come on, I've never met anyone who doesn't like chicken noodle soup. Here is my ridiculously easy, relatively mess-free version of chicken noodle soup that I guarantee you'll love. The very best part is you won't have to deal a messy animal carcass afterwards because you use chicken breasts instead of an entire chicken. This recipe is actually near and dear to my heart because after giving birth to my daughter, my sister came to stay with me and made this for me. I couldn't get over how easy it was and it really hits the spot. I always have some frozen in the freezer just in case. 7. Add your cooked pasta and ENJOY! TIP: My family loves grated cheese and homemade croutons on top.